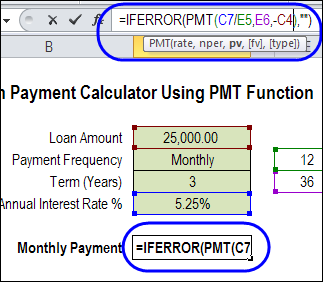 The PMT function calculates the payment for a loan that has constant payments and a constant interest rate. How Could You Use PMT? Nper is the total number of payments for the loan. Pv is the present value; also known as the principal. Fv is optional. It is the future value, or the balance that you want to have left after the last payment. If fv is omitted, the fv is assumed to be zero. Type is optional. If omitted, it is assumed to be zero, and payments are due at the end of the period. Use 1 in this argument if payments are due at the beginning of the period. The payment calculated by PMT includes principal and interest but does not include taxes, or other fees that might be associated with the loan. 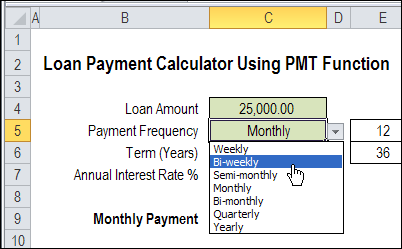 To see the steps for calculating a simple loan payment with the PMT function, watch this short video. The written instructions are below the video. The payment, -230.29, is calculated as a negative amount, because you are paying that amount out of your bank account. For Canadian mortgage loans, the interest is compounded semi-annually, rather than monthly, even if the payments are monthly. To calculate the payments, you need a different rate calculation, instead of the simple Rate/12. Note: Visit your bank's website, or check with your banker, to confirm how your bank will calculate the payments. (Rate /2 +1) is the semi-annual interest as a proportion of the annual rate. In this example, the rate is 5/2 = 2.5% each 6 months. So at the end of 6 months you owe 1.025 of what you owed at the beginning. The payment, -657.13, is calculated as a negative amount, because you are paying that amount out of your bank account. In the previous examples, you had to enter the total number of payments due, after calculating that number -- number of years in the loan term, times the number of payments per year. To make things easier, this Excel loan payment calculator lets you select the payment frequency from a drop down list of options. In the sample file, the Lists sheet has a lookup table of frequencies and number of payments per year, for each frequency. 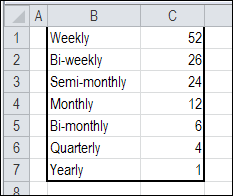 Based on the frequency that you select, a number of payments per year is calculated in cell E5, using a VLOOKUP formula. 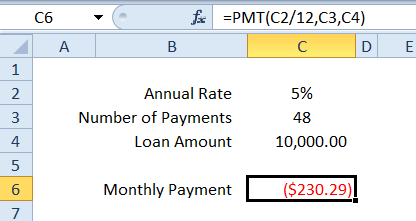 In this workbook, there is a minus sign before the present value variable, so the monthly payment is shown as a positive number. You can omit the minus sign, to show the payment as a negative number. 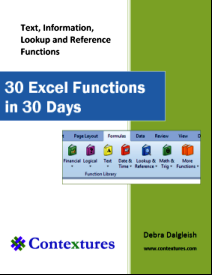 To see the formulas used in examples 1 and 2, download the PMT function sample workbook. The file is zipped, and is in xlsx file format. 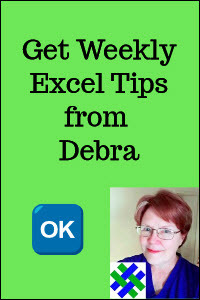 To see the enhanced loan calculator, download the Excel Loan Payment Calculator sample workbook. The file is in xlsx format, and zipped. 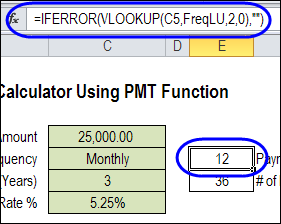 The calculator uses the IFERROR function, which was introduced in Excel 2007.